Too expensive for you to really want to exhaust him to use this ability, good as it is, meaning you need other dreamers. At least he has an arcane icon to allow you to commit to stories in your turn then use the ability. Overall he's OK but I think Misk have better ways to get cards, especially at that cost. Ideally you'll have other Dreamers to use, but his ability is okay enough on its own. I'd rather have it on a cheaper body with reduced stats, but worse cards certainly exist. Great repeatable card advantage that can dig deep into your deck. Putting the other cards on the bottom of your deck is what makes this good. 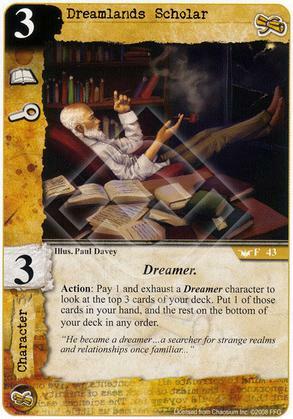 If you have other dreamers, standing effects or excess domains this becomes a good way to dig for an answer card. The problem I found with this dude is that Obsessive Insomniac is an obvious companion to the Scholar, which makes for kind of redundant effects from two of your characters. They're not the same effect, but typically I'm using one effect in lieu of the other. And since the Insomniac is cheaper and his ability is free, his ability will usually be the winner. The Scholar has his uses, but those uses won't usually bring enough to the table.